Italy’s artistic contribution surpasses that of any other nation, whilst Tuscany’s bucolic scenery is home to more historical monuments than any other entire country on earth. For centuries Italy has attracted visitors in search of culture and romance and there are few countries that can rival its renowned Classical origins, its art, music, architecture, scenery, food and wine. As home to the Roman Empire, the Renaissance, the Roman Catholic Church and the Vatican, its contribution to the arts surpasses that of any other nation. Tuscany embodies much that Italy is famous for, possessing more historical monuments than any other country, let alone province, on earth. 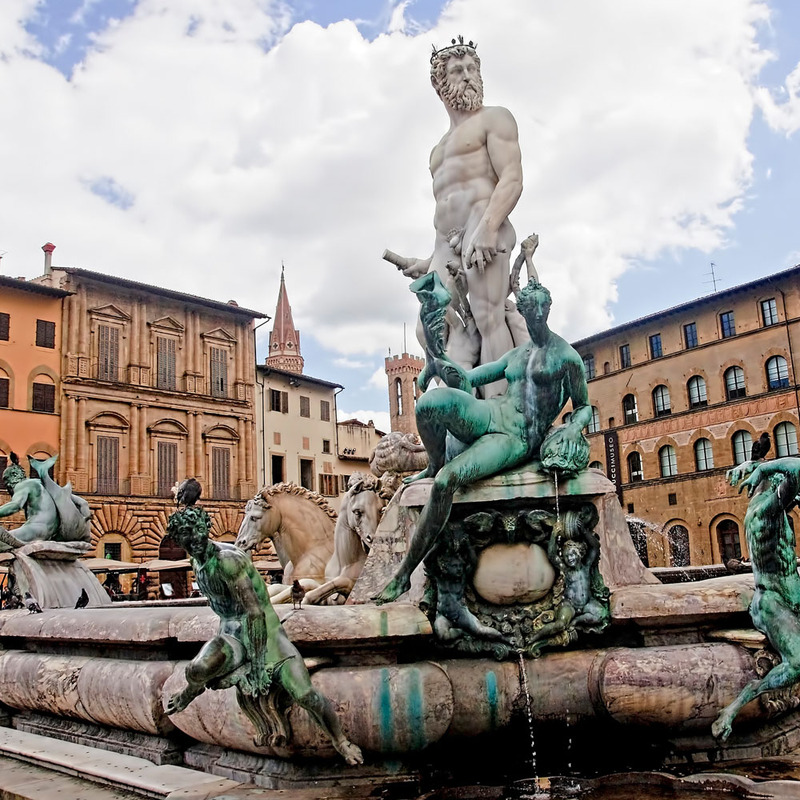 Its cities, Florence, Siena and Pisa, together with smaller towns and medieval villages like Lucca and San Gimignano, house some of the world’s finest artistic treasures. Combine this with the haunting beauty of the local countryside, an enviable climate, one of the world’s great cuisines, and you have all the ingredients for a superb holiday. Florence defies description, arguably the finest city of the Renaissance and often described as the most beautiful city in Italy. Browning sighed over its idyllic charms and E.M. Forster described it in “A Room with a View” as the perfect antidote to Anglo- Saxon life. 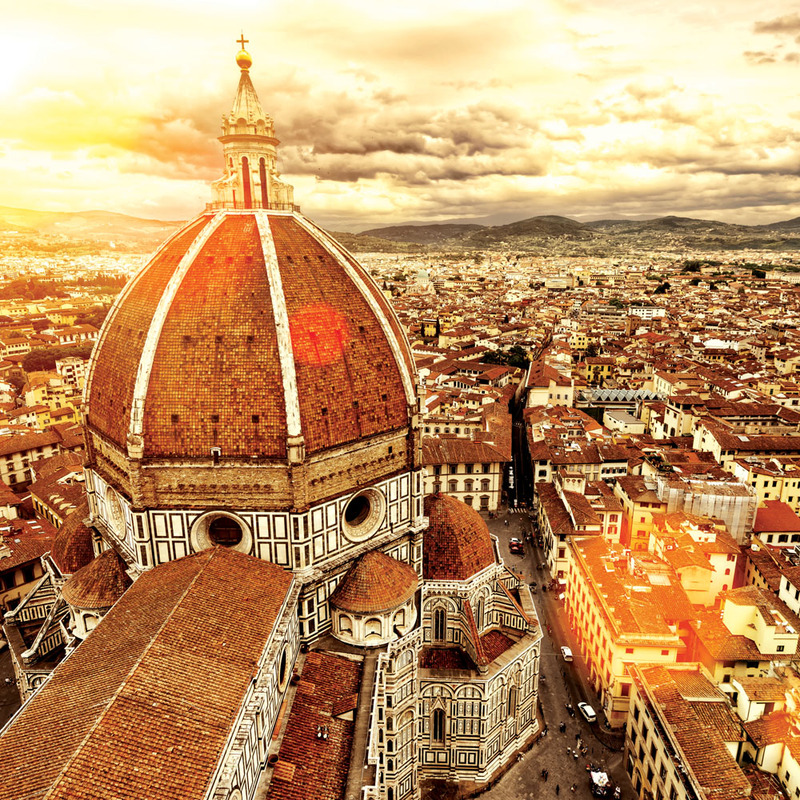 It owes its wealth to the commercial explosion that emerged after the Dark Ages when wool and other textile industries, backed by some of the very first international banks, turned Florence into one of the world’s richest cities. Political power was in the hands of just a few families, in particular, the Medici, who married into most European royal families, including our own. Florence thus became the cultural and intellectual heart of the continent: architects, artists and sculptors flocked here and once engaged by the nouveau riche, were soon busy filling the churches and palaces to bursting point with some of the world’s most outstanding works. Michelangelo, Leonardo da Vinci, Raphael, Titian plus countless others, created many of the masterpieces now on display in the Uffizi, one of the world’s greatest galleries. Then there is the city of Pisa, famous for its leaning tower, situated in a complex of ecclesiastical buildings, as remarkable today as they must have seemed to the medieval pilgrims on their way to Rome. Next we visit San Gimignano one of the best preserved medieval villages you will find anywhere in Europe, famous for its immense stone towers, dramatically rising upwards, creating its unique skyline. Siena is the other great Tuscan city enclosed behind vast defensive walls, dominating the surrounding countryside like the fortress it is. The city is quite outstanding and has arguably the most gracious square, the Campo, in the world. Tuscany and its classic countryside is the very essence of Italy. Gently undulating, biscuit coloured hillsides often covered with vineyards flow and disappear into the distance. Punctuated by isolated farmhouses, unchanged for centuries and studded by tall cypress trees, these wonderful landscapes yield a rich harvest of superb food and wine. Tuscan cuisine is simple, using the finest ingredients such as grilled succulent meats, fresh vegetables, the unique pecorino cheese, thick wholesome soups, a hint of olive oil and garlic, creating tasty, healthy menus. In Tuscany you have some of the world’s finest wines too, such as Brunello, Montepulciano and of course Chianti. Tuscany embodies the true characteristics of Italy and the Italians themselves. Stylish, always ready to help, justifiably proud of their heritage, vibrant, expressive and just – different! You should arrive at the airport to take your flight. On arrival, a coach will take you to Florence and our hotel where we stay for three nights with breakfast, at either the three-star superior rated Hotel Corona D’Italia, ideally located in the San Lorenzo district of the city, ten minutes walk from the Cathedral. All the rooms have private facilities, air-conditioning, mini-bar, hairdryer, television and telephone. The hotel has a bar and breakfast room. Or there is the four-star rated Grand Hotel Mediterraneo. This hotel enjoys an enviable position on the banks of the River Arno, close to the Piazza Santa Croce and well located for easy access into the historical centre. All the rooms have air-conditioning mini-bar, satellite television, safe and hairdryer. The hotel has a choice of restaurants, offering international and Italian cuisine, plus a lounge, American bar and terrace (summer only). After breakfast you have a guided walking tour of Florence, “pearl of the Renaissance”, a superb and beautiful city and deservedly on the traveller’s map since the days of the Grand Tour. The sights are legendary and you see some of the best of them: the Cathedral – which can house a congregation of thousands and the Baptistry – the oldest building in the city. 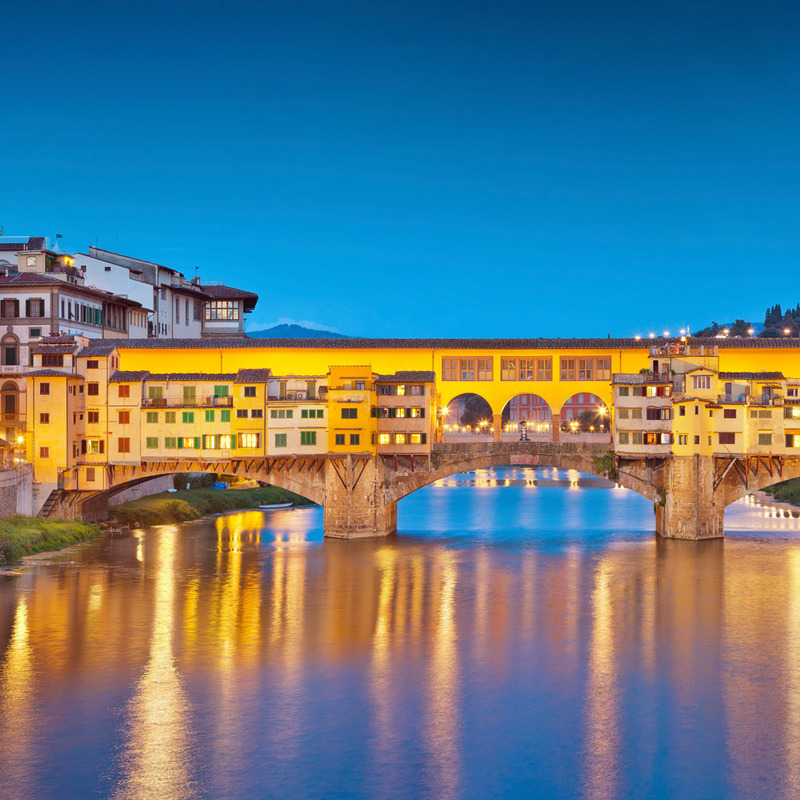 You will also see the Ponte Vecchio – the superb bridge over the river Arno, lined with goldsmiths and a symbol of the city itself. During the afternoon you have a reserved visit to the Uffizi art gallery where superlatives are the minimum expressions you can use to describe its phenomenal collection. Built up over three hundred years, this originally private collection belonging to the all-powerful Medici family, and subsequently bequeathed to the people of Florence, contains masterpieces by some of the greatest artists who have ever lived: Botticelli; Leonardo da Vinci; Michelangelo; Titian; Rembrandt and Van Dyck. There are many more too, literally room upon room of them which will amaze you! After breakfast you leave for Lucca, birthplace of the great composer Puccini, a delightful city where you can wander amongst the medieval streets, tiny piazzas and along the ramparts circling the city. Its cathedral is outstanding and famous as one of the most intricate in Tuscany. 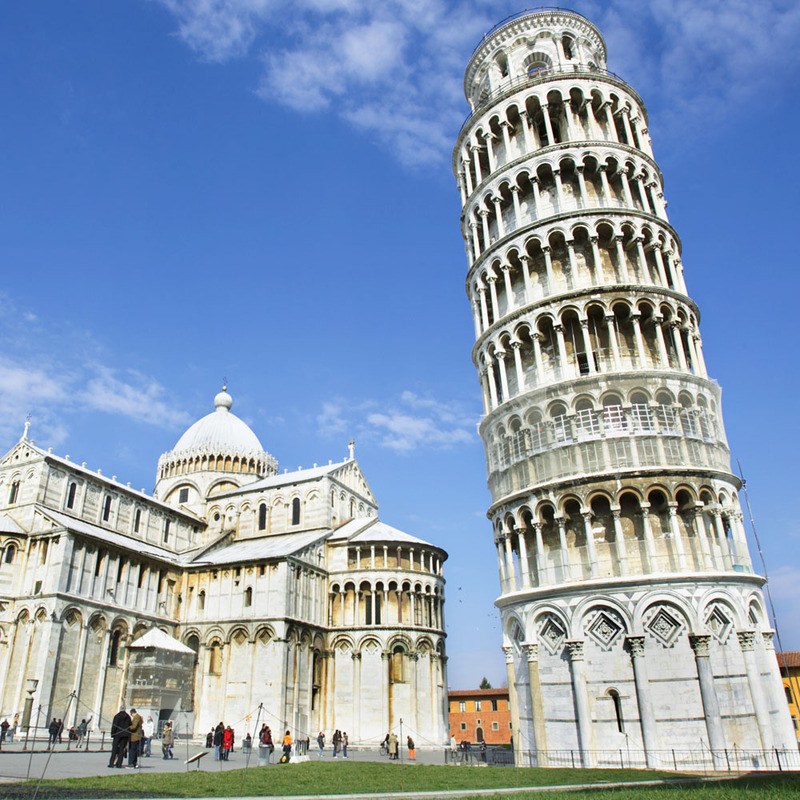 Then you take the short drive to Pisa where nothing can prepare the visitor for the almost shock-like impact of its bizarre leaning tower! Famous since the dawn of tourism, it has tilted since it was built over six hundred years ago and today still remains one of the great must-see buildings on earth. We then return to our hotel. Florence will amaze you and there is so much to see, yet being medieval it is also so compact. Today you are free to explore this wonderful city of the Renaissance. There is the Accademia, the oldest art school in the world which houses Michelangelo’s David, one of the world’s finest sculptures; the Archaeological museum containing an outstanding collection of exhibits from ancient Greece, Rome and Egypt; the Science museum which contains many of Galileo’s telescopes together with the world’s first adding machine. Situated in the medieval heart of the city is the magnificent cathedral, dominating the skyline, some of which dates from the 4th century. Built from white, green and pink marble it glows in the sunshine and the richness of the interior is remarkable with beautiful frescoes and an amazingly intricate marble pavement. However, Florence is much more than a city caught in the past, it has an ambience you will love, packed with cosy restaurants and street cafés where you can simply watch the world go by, the very essence of Italy and the Mediterranean lifestyle. No visit to Tuscany is complete without a visit to a typical cantina for a tour of the cellars and a taste of some of the most well-known wines in the world. We visit the world renowned Chianti area to visit the Foresteria Villa Cerna, one of the Cecchi family’s estates. For more than a century, the family was one of the area’s biggest and most important producers. After a tour and insights into the history and philosophy behind the brand, we sample some of their exquisite wines, and some typical Tuscan snacks. At the end of the day you drive to one of our carefully selected four star rated hotels in Tuscany for the next four nights with breakfast and dinner. The Park Hotel Le Fonti, partly converted from an old farm, is set on the edge of the old town of Volterra with spectacular views over the surrounding countryside, and has a bar, good quality restaurant and panoramic terrace. The Palazzo San Lorenzo is set right in the heart of the town of Colle di Val d’Elsa, known as the ‘City of Crystal’. Converted from an old hospital the hotel offers thoroughly modern comforts, a beautiful winter garden housing the bar and breakfast room, outside terrace and a restaurant serving delicious local specialities. Hotel Il Piccolo Castello is situated in its own grounds close to the walled hilltop town of Monteriggioni. Built on one level around a central garden the hotel is decorated with traditional frescoes and is a lovely relaxing base, with spacious lounge and manicured gardens, bar and restaurant serving delicious Tuscan food. Rooms in all hotels are air conditioned with private facilities, mini bar, safe, television and telephone. In short your comfort is assured whichever hotel you stay in. After breakfast we explore the rural Tuscany made famous by Renaissance paintings, literature, films and travel posters – a truly extraordinary landscape of undulating hillsides, vineyards, ochre-coloured valleys, terracotta-tiled farmhouses and pencil pines. Volterra, an imposing town with immense stone ramparts, perched dramatically on a hill and affording panoramic views. The town’s small historic centre is a maze of narrow cobbled streets that emanate from the main Piazza dei Priori, one of the finest and best preserved in Tuscany. It’s truly atmospheric, especially during the evening when the locals meet for lively conversation. Enjoy the moment – sip a glass of wine and soak up the ambience as the evening sun bathes the town in its golden glow. Founded by the Etruscans as long ago as 800 BC, Volterra grew prosperous in the Middle Ages from mining and carving alabaster. Many artefacts from this period still survive in churches and cathedrals throughout Tuscany and beyond. Even today, alabaster carving remains the traditional Volterran craft. You’ll have the opportunity to visit some of the artisan outlets. The town also has outstanding museums housing priceless Etruscan and Roman treasures. A visit is guaranteed to heighten your appreciation of this impressive town. 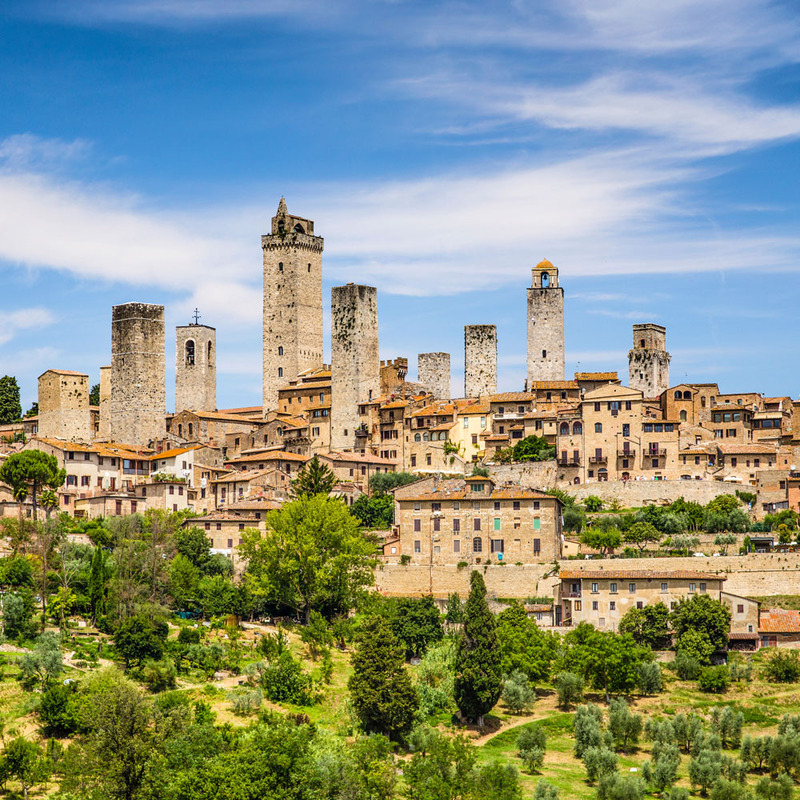 We then drive on through the countryside to San Gimignano, one of Italy’s most beautiful villages. The sight of a spectacular skyline with 14 medieval towers is one that will stay with you forever. There were originally 72 towers, all built by rival noble families during the 13th century as symbols of power and prestige. No other village in Tuscany captures the spirit of the age in quite the same way. It’s lovely to just wander through its cobbled streets and squares, taking in the views and simply absorbing its delightfully rural atmosphere. 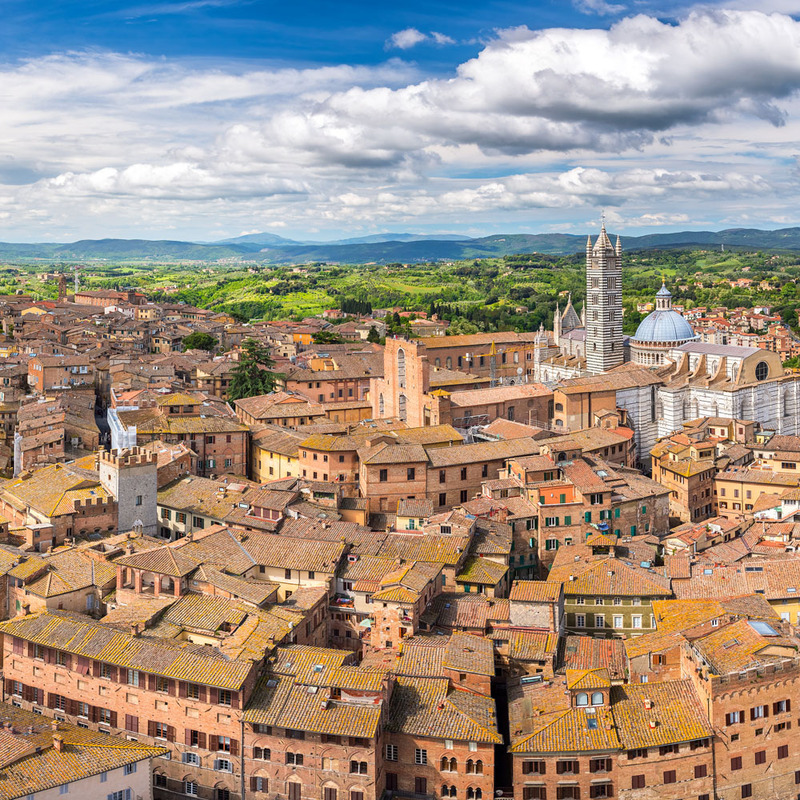 After breakfast we take the short drive to Siena, one of the finest medieval cities in the world which was, during the 12th and 13th century’s one of its richest and a similar size to Paris! An unrivalled period of building took place and the palaces, grandiose townhouses and spacious piazzas you see today, were created. The main square, the Campo, is widely acknowledged as one of the world’s finest! Unusually formed in a half-moon shape, the square is surrounded by tall and centuries old buildings, all very different and yet also harmonious. With its abundance of pavement cafés, just enjoy a coffee and reflect on all the visitors who preceded you. 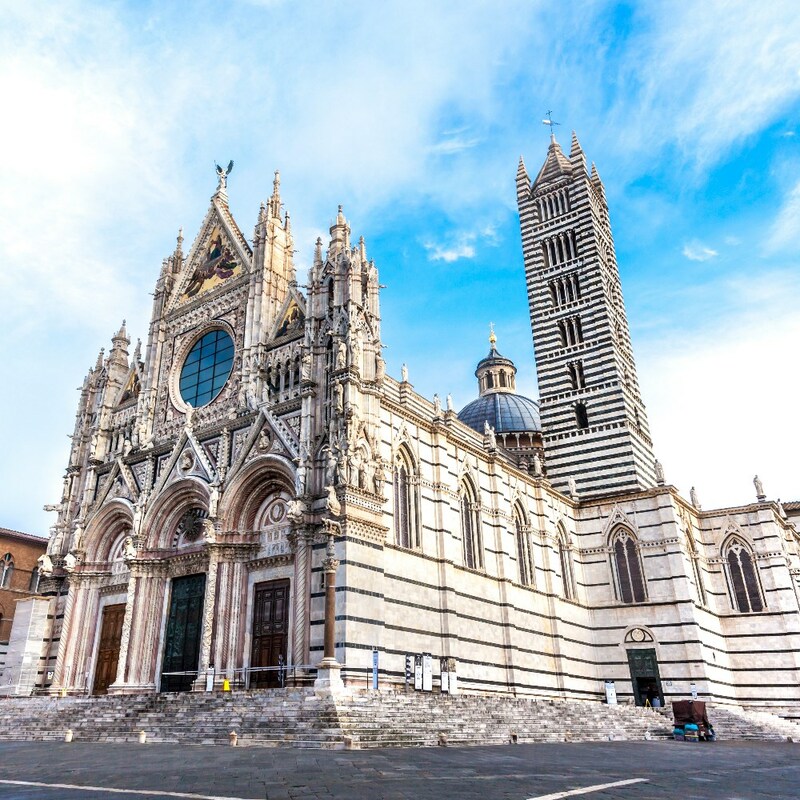 Perhaps the finest place to visit in Siena is its outstanding cathedral, one of Italy’s greatest. Built from black and white marble it has some of the most intricate carvings imaginable, some of which are by the great master himself, Michelangelo. The floor is a revelation, laid with countless thousands of interlocking stones, creating a unique inlaid surface at which, one can only marvel at the sheer skill of its creators. Impressive as it is today, had a planned additional nave been completed during the 14th century, it would have created the largest church in Christendom. The Black Death halted construction as two thirds of the population perished and the city fell into rapid decline. Little else was built but fortunately even less demolished, thus accounting for Siena’s remarkable preservation. We will have a guided tour of the city and during the afternoon you are free to explore as you wish. Today we have a free day to explore as you wish. So what is it to be? A stroll around the village, a coffee in the main square watching the world go by, a dip in the hotel pool or just catch up on some reading – the choice is yours. The coach will transfer us to the airport at the appropriate time to take our return flight home. The price of this holiday is per person, based on two people sharing a twin room. Single rooms are subject to availability at the relevant supplement. The price includes seven nights’ accommodation with breakfast and four dinners, all tours as mentioned, entrance to the Uffizi gallery, airport departure taxes and transfers, flights as mentioned, all local accommodation taxes and the services of a Riviera Travel tour manager. Not included in the price is the entrance fee to climb the Leaning Tower of Pisa. 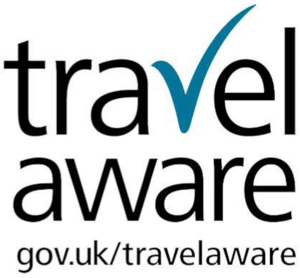 Should you wish to do so, the cost is approximately €18 and is payable locally. For marvellous views of Florence, take a ride with a local guide to the surrounding hills in a classic Fiat 500. When the sun sets, the city’s remarkable buildings and medieval stone bridges come alive through tasteful illumination. During your 2-hour tour, your guide will share stories of the places you see and you’ll pause for some excellent gelato before returning to the city.